Spray Polyurethane Foam (SPF) is a form of plastic that goes from liquid to solid in a matter of seconds, increasing in volume approximately 30x as it dries. It is the most cost-effective and sustainable roofing, insulation and waterproofing system available today. SPF is very low in the emission of Volatile Organic Compounds (VOCs). It is free from chlorofluorocarbons (CFCs) – which have been shown to adversely affect stratospheric ozone. It is the most energy-efficient form of insulation there is. It eliminates the need for costly roof tear-offs and the burden this places on landfills. Versatility: The physical properties of SPF can be varied according to the purposes to which it is put. Its texture can range from soft to semi-rigid to high-density roofing foam that can sustain the pressures of heavy weather, heavy equipment and heavy human traffic – indefinitely. Construction Industry: Roofing and roof stabilization – plus insulation for walls, ceilings, attics and basements. Because it is composed of billions of closed cells, the foam acts as an air barrier, reducing moisture infiltration, which is the leading cause of building deterioration. Tankage and Refrigeration: For any market sector that requires insulated cooling or freezing facilities and storage containers – including the wine, agricultural, recreational, oil, gas and chemical processing industries. Transport: SPF is used to insulate shipping containers for planes, trains, trucks, trawlers and tankers. 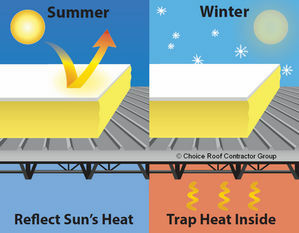 SPF roofs last indefinitely and hold their insulation value forever. They withstand extraordinary weather events – which is why SPF was chosen for the new roof on the Louisiana Superdome. When compared to other roofing systems having the same R-value, slope considerations and warranty, SPF roofs are usually more economical. When the life cycle costs of all roofing systems are compared, SPF is the most economical choice by a very wide margin. Warranties are available from Ace Insulation Services and our vendors depending on the need and desires of the end user. From coating warranties to full system 20-year warranties including a guarantee that the roofing system will not become disbonded from the substrate in ANY WIND EVENT, are available throughout the United States and abroad. Can be applied rapidly with little or no disruption to the facilities. Requires fewer people to apply – which reduces the likelihood of accidents. Eliminates the need for multiple levels of roofing required by conventional systems. Conforms to all roof shapes and types. Can be applied directly over asphalt, shingles, built-up roofs, clay tile, concrete, metal and wood. Produces energy savings of 30% compared to alternative roofing systems. Evens out roof surfaces so there are no dips where water can collect. Self-flashing and seamless – therefore no leaks. Is highly resistant to chemical attack. Requires minimal upkeep to remain under warranty. Lasts forever if properly maintained. Elastomeric Coatings: To further weatherproof a structure – and enhance its capacity to sustain normal seasonal expansions and contractions – we finish each job by applying a UV resistant coating system with or without a granular surface. Our elastomeric coatings have outstanding durability and low-temperature flexibility. They have very little odor and low VOC emissions. As the cost of energy increases, so will the demand for SPF roofs. ACE is an industry leader in SPF for roofing and every other application of this amazingly safe and useful material.